How you technically make money in Forex? Before trading, you must know how to read a quote. Trading is done in pairs of currency. For example, if the currency pair is EUR/USD, then the quote for this currency is 1.4453. The first currency is known as the base currency and the second is the quote currency. What it means is that you can buy 1.4453 Dollars for 1 Euro. When buying, the exchange rate tells you how much you have to pay in units of the quote currency to buy one unit of the base currency. When selling, the exchange rate tells you how many units of the quote currency you get for selling one unit of the base currency. The base currency is the “basis” for the buy or the sell. If you buy EUR/USD this simply means that you are buying the base currency and simultaneously selling the quote currency. Indeed, in this example, you need to “buy” euros by “selling” dollars. You would buy the pair if you believe the base currency will appreciate (gain value) relative to the quote currency. On the other hand, you would sell the pair if you think the base currency will depreciate (lose value) relative to the quote currency. To understand Forex quotes, you must also understand bid and ask prices. All Forex quotes are quoted with two prices: the bid and the ask. Most of the time, the bid is lower than the ask price. This is, in fact, how Forex brokers are being paid. They are not paid on the trades placed in the Forex market but on the bid/ask spread instead: the difference between 2 prices. Forex brokers make their commission by selling currencies at a slightly higher rate than they buy them. This is perfectly legal and all Forex brokers do it, though the amount of the spread may vary. The quote to the left of the / (1.4453) refers to the bid or “sell” price (what you obtain in USD when you sell EUR). The quote to the right of the / (1.4455) is used to obtain the ask or “buy” price (what you have to pay in USD if you buy EUR). This difference between the two prices is called the spread which is retained by the Forex broker as their profit on the trade. Spread can be fixed and variable. It depends on the type of account you will open. If the spread is fixed it will always be the same (in the situation above, 2 pips and always 2 pips). If the spread is variable, it will depend on the liquidity of the market. Big liquidity= small spread, low liquidity=big spread. Note that variable spreads are not interesting for us, they are more interesting for scalpers. Scalpers are traders who trade at super small timeframes, in a very fast and stressful way. And as our unique Forex education program is all about cancelling stress and emotions to make money, we like to have fixed rules and fixed spreads! To make a profit, in the Forex market, you can enter the market as a *buy position* (known as going “long”) or a *sell position* (known as going “short”). For discussion, let’s assume you’ve been studying the EURO. Our very own system tells you that prices should rise during a particular timeframe. So you buy the EUR/USD pair (or, technically, you will simultaneously buy euros, the base currency, by selling your dollars). So, since you believe that the market price for the EUR/USD pair will go higher, you will enter a *buy position* (going long) in the market. For simplicity sake, let’s say you bought one lot at 1.4455. You know that as long as you sell back the pair at a higher price, then you make money. Note: This might look complicated, but it’s not! Indeed, this seemingly elaborate process is handled, and even calculated for you, via the broker’s software mentioned above. I am now explaining to you the whole process in detail but software and technology make it dead easy, by the simple click of your mouse! Let’s now take another example and show you how we make money while selling (or going short) in the Forex market. REMEMBER: Selling (“going short”) the currency pair implies selling the first, base currency, and buying the second, quote currency. You sell the currency pair if you believe the base currency (EUR) will go down relative to the quote currency (USD), or equivalently, that the quote currency (USD) will go up relative to the base currency (EUR). PLEASE NOTE (again): While the Profit Calculations, on the short-sell trade scenario below, may seem somewhat complicated if you’ve never been in the Forex market before, trust me when I say, “this process is nearly seamless through your broker trade station (software)”. I am just showing you this thought process so you can SEE how a PROFIT occurs even when SELLING a currency pair. The current bid/ask price for EUR/USD is, once again 1.4453/1.4455, meaning you can buy 1 EURO for 1.4455 US Dollars or sell 1 EURO for 1.4453 US Dollars. Suppose you see a beautiful http://SurfingThePips.com sell set-up and you feel the EURO is overvalued against the DOLLAR. To execute this strategy, you would sell EUROS (simultaneously buying DOLLARS), and then wait for the exchange rate to fall. So you make the trade: selling let’s say, 100,000 EUROS and purchasing 144,530 US DOLLARS. (Remember, the word LEVERAGE I mentioned before?) Here it is. If your broker account is set with a 1/100 leverage your will be able to manage €100,000 using only €1,000 , your initial margin deposit). As you expected, EUR/USD falls to 1.4405/1.4407, meaning you can now buy €1 EUR for $1.4407 USD Dollar or sell €1 EUR for 1.4405. Since you’re short EUROS you must now buy EUROS by selling back the US DOLLARS to realise your profit. 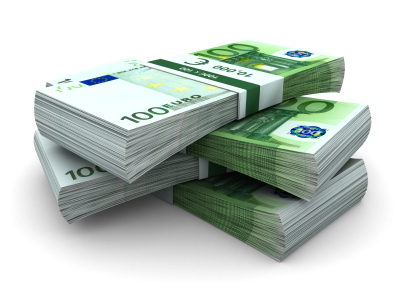 You buy EUR 100,000 at the current EUR/USD rate of 1.4407, and receive 144,070 USD DOLLARS. Since you originally bought (paid for) 144,530 USD Dollars, your profit is 460 US DOLLARS. To calculate your profit in EURO now you can divide the $460 by the current EUR/USD rate. As you can already see, it is possible to make money fast trading Forex! Continue to the next forex training lesson: Why Forex is the Ferrari of trading?